Here's a chart of the 2009 fertility rates of a selection of countries. 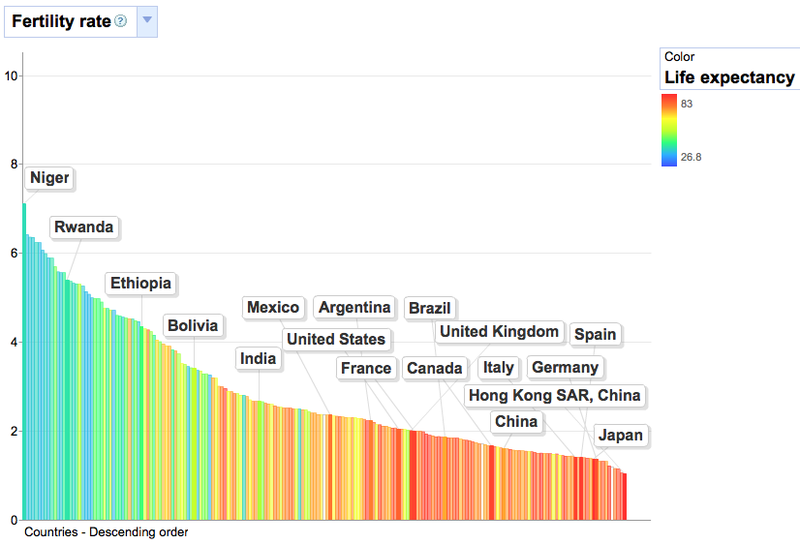 Go here and you can play with the selections, courtesy of Google and the World Bank. Move the slider at the bottom to the left and watch how global fertility rates were much higher in the not-too-distant past. 20 years ago Brazil, for example, had a fertility rate of 2.9, and now it is less than 1.9. (Note: 2.1 is considered to be the replacement rate, below which a population will eventually shrink.) Currently, all countries to the right of the United States have fertility rates at or below replacement levels. The developed world population will be shrinking within a few decades, and the rate of population growth in the lesser developed countries will likely continue to decline dramatically for the foreseeable future. When I was young, I remember all the dire warnings about the "population time bomb." Global population was careening out of control, projected to exceed 14 billion by the end of this century. Today the situation has completely reversed: now there are projections which say that global population will peak at 7.5 billion around 2040. Before you know it, the world's biggest problem will be a dearth of new babies and dramatically shrinking populations. One implication: when speaking of developed countries, it will soon be necessary to specify real GDP in per capita or per worker terms. For example, Japan's relatively slow rate of reported GDP growth becomes healthier when taking into account a shrinking workforce and an aging population. An economy's population can shrink and the size of its economy can stagnate, while still growing in per-person terms. The birth death is most depressing to me. It seems that this a spiritual problem as many people have lost faith in the future and instead focus on material gratification in the present. Without children, our future is bleak. I was interested in this a few years back and remember reading some research suggesting the world population will shrink, not grow. Opposite of common wisdom at the time. The Japanese haven't lost anything in the past 20 years but everyone still thinks of it as a lost decade. Too many ivory tower analyses. BTW, is it to late to get my Club of Rome membership fee back? You know what it costs to raise kids these days? Median household income is now less than %50k. Maybe the top one percent can get busy and work on this problem. Most others can't afford it. Coming from Africa I know that the unplanned doubling of populations in a decade or two has been a catastrophe - thanks to miracle medicines. Now due to internet and consumerism it will voluntarily reverse. We will solve all our planets problems this way. It is very good news for our children's generation in a machine assisted world. Interesting to note that two Canadian life insurance companies both reported weak results today partially based on a surprising increase in the mortality rate. In the US, it probably has a lot to do with economic confidence. I know that I have a graduate degree and a good job -- and I've put everything in life on hold until the economic picture last year. Three years ago the world almost ended! Who knows what's next? I could get laid off, we could have hyperinflation, we could have a double dip that pushes unemployment to 15%, who knows. I can't even think about getting married, buying a house . . . let alone having children! If we want higher birth rates, step #1 is fixing the economy and instilling some confidence in the future. Step #1 towards doing that is making Barack Obama unemployed next November. Low birthrates have fascinated me for many years. First, understanding of falling populations and workforce numbers goes a long way to explaining slow GDP growth figures from Japan and Europe. As a former reporter, I expect the media to get it wrong, but I can't excuse economists, who must surely know that the nominal numbers that they use are misleading, if not down right false. Another area that falling birth rates could dramatically impact is immigration. Mexico's birth rate likely has fallen to just around replacement rate. While there are many factors into a decision to hop across the border, certainly fewer young people could slow the numbers coming across. However, the economy of Mexico will have a major impact on immigration as well. But it wouldn't be shocking if mild economic growth in Mexico combined with falling numbers of young people leads to decreased immigration in coming decades. Indeed, already illegal immigration from Mexico has almost stopped due tighter boarder enforcement and slow economic growth in the U.S.
Also, across the Pacific, China, with it's extremely low birth rate and aging population, doesn't strike me as needing Lebensraum. Maybe being the new big kid on the block just requires you to pick fights and show that you can push people around, but China certainly has no pressing need to grow territorially. Also, aging populations don't like wars, particularly when you risk losing your only child in battle. CFP: Thanks for your contribution to this discussion! With the help of a man called Dr.Addo I was able to get pregnant though his root and herbs. I'm 47years of age, it was really difficult for me to pregnant though my husband loves me but it was really hurting me not having my own child but after many years I came across Dr.Addo. I'm 7months pregnant now through the help of the wounderful man and I will advice everyone looking for help to get pregnant to contact this gretae man via his email at: ( addosolution@gmail.com ) and be happy like me.